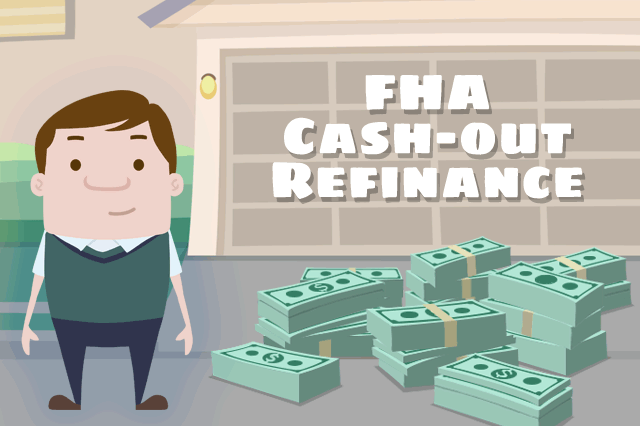 How Soon Can I Cash-out Refinance an FHA Loan? FHA cash-out refinance loans let the borrower take out equity in the property in cash. According to page 409 of the FHA handbook, one of the first questions you’ll be asked involves how you are currently using the property to be refinanced. June 27, 2017 - "How soon can I refinance an FHA loan?" is a common question, but unfortunately the answer depends on several variables including the type of FHA refinancing you seek and how long you have owned the property to be refinanced. There are several FHA refinance loan options. One, the FHA Streamline Refinance option, is for FHA-to-FHA refi transactions only. This type of refinancing isn’t for those who need cash out, and must result in a tangible benefit to the borrower. Another option, FHA no-cash out refinancing, is (from the name alone) definitely not for those who need to tap into the equity built up in the home. FHA cash-out refinance loans let the borrower take out equity in the property in cash. According to page 409 of HUD 4000.1, one of the first questions you’ll be asked involves how you are currently using the property to be refinanced. That one year minimum time can be tricky for some who don’t understand that the one year requirement involves calculating 12 full months from the time the new FHA case number would be assigned. There are a variety of ways your lender may verify this but HUD 4000.1 instructs the lender that the following steps must be taken in addition to whatever lender standards may require at that particular financial institution. "The Mortgagee must review the Borrower’s employment documentation or obtain utility bills to evidence the Borrower has occupied the subject Property as their Principal Residence for the 12 months prior to case number assignment." What else does HUD 4000.1 say about FHA cash-out refinance loans? In addition to a maximum LTV of 85% for cash-out refinancing, HUD 4000.1 adds an on-time mortgage payment requirement. "The Mortgagee must document that the Borrower has made all payments for all their Mortgages within the month due for the previous 12 months or since the Borrower obtained the Mortgages, whichever is less. Additionally, the payments for all Mortgages secured by the subject Property must have been paid within the month due for the month prior to mortgage Disbursement." Borrowers who don’t fit the above criteria may find it better to wait until there are 12 full months of on-time payments on the books before filling out the FHA refinance loan application.